Pizza night just got a fall makeover. Butternut Squash Pizza with caramelized onion is an EPIC blend of buttery fall flavor that will make everyone look forward to pizza night! PIZZA NIGHT! Two words that always bring a smile to my face! Not only do my hubby and girls look forward to this night, but making a weekly dinner plan around this theme is soooo easy. I always know what we’re having that night. My challenge is to come up with new and healthy pizza options that are crave-worthy and keep this sacred night interesting. We enjoy Zucchini Noodle Crusted Pizza in the summer, Cauliflower Pizza Bites and Pizza Stuffed Mushrooms to keep things low-carb, a favorite pizza combination to inspire Hawaiian Pizza-Dillas and even enjoy Pumpkin Pizza. Almost every time we incorporate seasonal produce in our Friday night ritual, we are rewarded with something special. 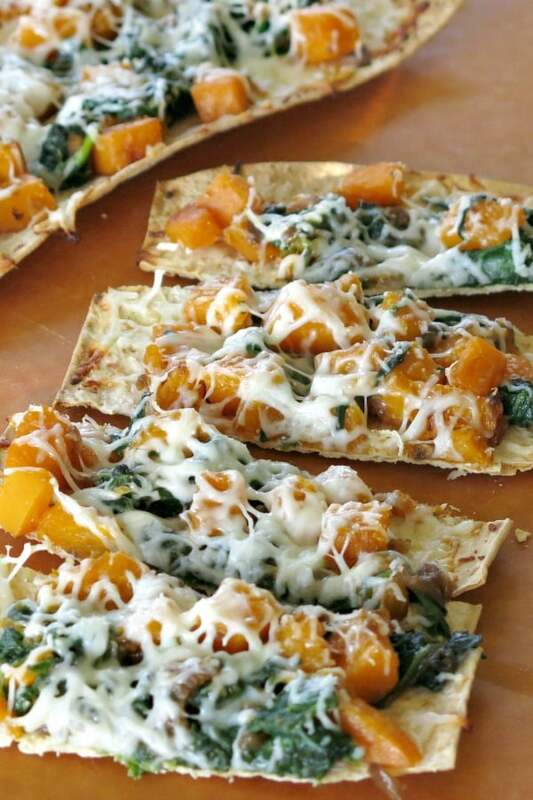 And, butternut squash pizza is no exception. 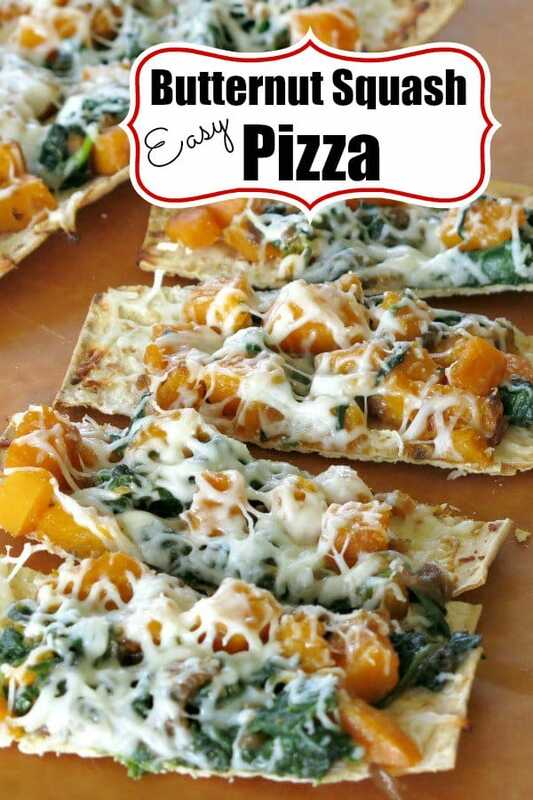 It’s a simple combination of butternut squash, caramelized onion and spinach with a cheesy mozzarella topping that makes it pop! Peel and dice the butternut squash in advance. You’ll be ready for this recipe or so many other delectable uses, such as Butternut Squash and Spinach Quesadillas. Squash will keep in the refrigerator for up to 5 days. Cut the cubes in small 1/2 inch sized pieces, preferably. The smaller the size, the quicker they will cook on the stove top. Roasted butternut squash is also an option. Use this if you are already making a recipe that calls for butternut squash, like Creamy Butternut Squash Soup. Make a big batch of Slow Cooker Caramelized Onions and freeze the bounty in small portions. Use flat bread to make this recipe quickly and keep the carbs down. However, any type of crust will work. This Homemade Whole Wheat Pizza Crust sounds fantastic! Make this recipe vegan by using dairy-free cheese and butter. Use gluten-free pizza crust, if desired. 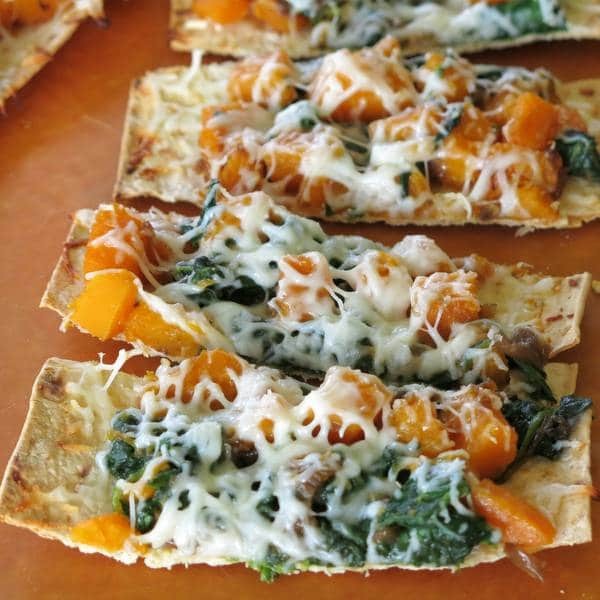 Flat Bread Butternut Squash Pizza with Caramelized Onions and Spinach melds buttery fall flavors and will have everyone looking forward to pizza night! Heat olive oil and butter over medium-high heat. Add butternut squash and saute for about 5-7 minutes or until squash is just about fork tender. Add spinach leaves and saute for about 3 minutes more or until spinach has wilted. Stir in caramelized onions. Remove flat breads from oven. 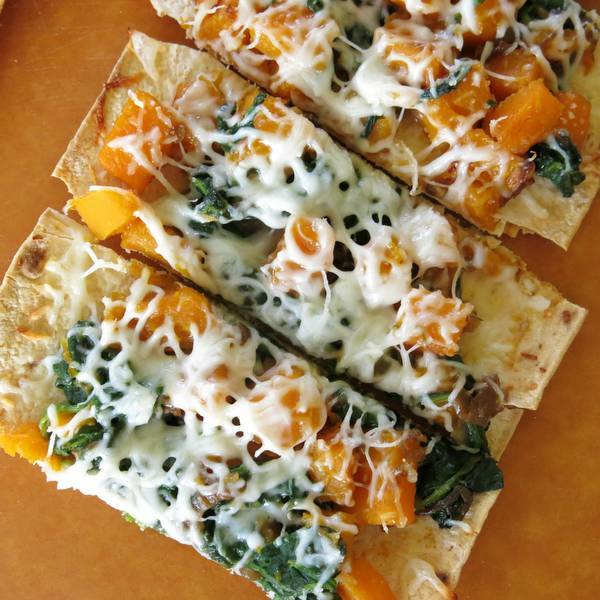 Distribute ¼ of the butternut squash, spinach and onion mixture over each slice of flat bread. Sprinkle 1/2 cup mozzarella cheese over the top of each slice. Return flat bread to the oven and cook for 4-5 minutes more or until cheese has melted. Butternut squash can be peeled and diced up to two days ahead of time. Wow, that looks amazing. Thanks for sharing! A great combination for pizza or anything! This is my kind of pizza! it looks awesome! I might add a little leftover turkey to this! Totally going to have to try this at my next dinner party! I love butternut squash on pizza! And you can never go wrong with caramelized onions! Great combo!